The doctors of Government General Hospital (GGH) in Guntur transplanted the heart of a brain dead man to a needy patient there on Tuesday. Subba Reddy, 35 years, who was injured in a road accident in Ongole of Prakasam district, was shifted to Nellore Private Hospital for better treatment where he was declared brain dead on Tuesday. 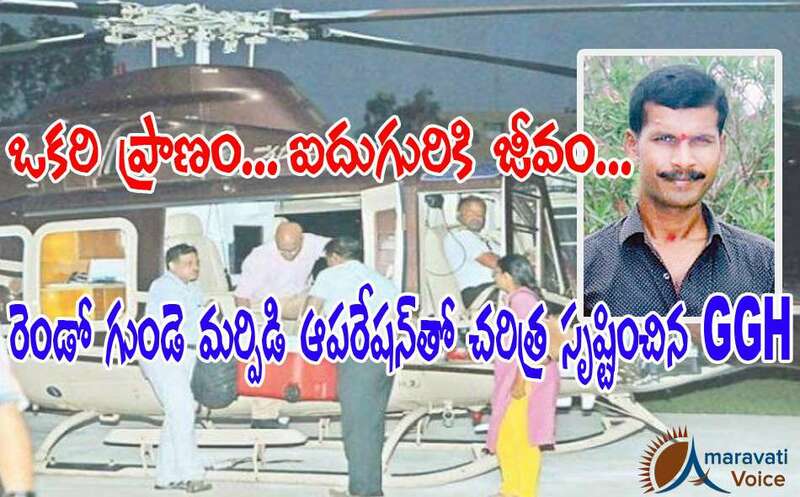 However, with the consent of his family members, Subba Reddy's heart was air lifted to the Guntur GGH by a helicopter and further by green channel. The doctors at GGH transplanted the heart to Heeramun bhai, 28 years, of Kurnool who was undergoing treatment for cardiomyopathy. Rs.30 lakh would have to be spent for heart transplantation, but the GGH has performed the surgery free of cost. The doctors' team included Dr.Gopala Krishna Gokhale, Dr.Srinivasa Rao, Dr.Bharadwaj, Dr.Sudhakar, Dr.Subrahmanyam, Dr.Chiranjeevi, Dr.Sridevi and Dr.Hanumanth Naik. On the occasion, GGH Superintendent Dr.DV Raju Naidu said that the patient is recuperating and added that the GGH Will now become famous for performing heart transplantation surgeries at Zero expenses.